Tree frogs have specially adapted self-cleaning feet which could have practical applications for the medical industry. "Tree frog feet may provide a design for self-cleaning sticky surfaces, which could be useful for a wide range of products especially in contaminating environments - medical bandages, tyre performance, and even long lasting adhesives," says researcher, Niall Crawford at the University of Glasgow who will be presenting this work at the Society for Experimental Biology Annual Conference in Glasgow on 3rd of July, 2011. Tree frogs have sticky pads on their toes that they use to cling on in difficult situations, but until now it was unclear how they prevent these pads from picking up dirt. "Interestingly the same factors that allow tree frogs to cling on also provide a self cleaning service. To make their feet sticky tree frogs secrete mucus, they can then increase their adhesion by moving their feet against the surface to create friction. We have now shown that the mucus combined with this movement allows the frogs to clean their feet as they walk," says Mr. Crawford. The researchers placed the White's tree frogs on a rotatable platform and measured the angles at which the frog lost its grip. 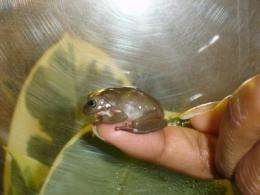 When the experiment was repeated with frogs whose feet were contaminated with dust they initially lost grip but if they took a few steps their adhesive forces were recovered. "When the frogs did not move the adhesive forces recovered much more slowly," says Mr. Crawford. "This shows that just taking a step enables frogs to clean their feet and restore their adhesion ability." White's tree frogs have tiny hexagonal patterns on their feet, which allow some parts of the pad to remain in contact with the surface and create friction, whilst the channels between allow the mucus to spread throughout the pad. This mucus at once allows the frog to stick and then, when they move, also carries away any dirt. If this can be translated into a man-made design it could provide a re-useable, effective adhesive. I could see the use of this. Similar R&D is being done on gecko's feet; which have similar characteristics, minus the mucus.